“I’m so proud to earn Kris’s [Kobach] support. Kris has been a true leader on securing our borders and stopping the flow of illegal immigration into this country. We need more conservative leaders like Kris willing to stand up for the rule of law. With Kris on the team, I look forward to working with him to take forceful steps to curtail illegal immigration and to support South Carolina and Arizona that are stepping forward to address the problem,” This quote came from Republican presidential candidate Mitt Romney. As I explained in a previous article a few weeks before, Kris Kobach is counsel for the Immigration Law Reform Institute—the legal arm of the Federation of Americans for Immigration Reform (FAIR). The Southern Poverty Law Center has described FAIR as an anti-immigrant extremist group. The Southern Poverty Law Center is one of the country’s leading civil rights organizations fighting right wing extremist groups like FAIR. Needless to say, Kris Kobach is a leading member in FAIR, so this makes him an anti-immigrant bigot. Kris Kobach was also one of the legal advisers for helping the states of South Carolina and Arizona draft their state immigration laws. For Mitt Romney to not only receive support from the likes of Kris Kobach, but for Mitt Romney to fully support Kris Kobach in return, shows that Mitt Romney is in fact anti-immigrant . The above quote that Romney gave is proof of that. Further, Romney is on record as saying he will veto the federal DREAM Act if passed by the U.S. Congress and that he will never pursue immigration reform that gives a pathway for undocumented but will use law enforcement only. 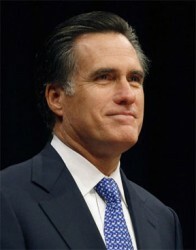 Mr. Romney can claim that he is the son of a Mexican father and a Welsh mother, but this does not change his personal stance. For U.S. Senator Marco Rubio (Republican-Florida) to say that Mitt Romney is “not anti-immigrant” is a back slap against other Republican Latinos who clearly say otherwise. There are Republican Latinos who are saying that Romney should brake with Kris Kobach if he is to get the Latino vote not only within the Republican Party but also nationally in the November election. *Note: Many in the Mitt Romney campaign may seriously object to what I have stated above. However, I should point out that I am quoting reliable sources and material to back up my arguments. If any in the Romney campaign find my stuff “slanted,” they should first try to knock down the sources I have used to disprove me.